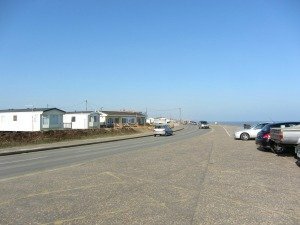 Walcott Norfolk sits right on the edge of the coast, with its main road running parallel to the beach. 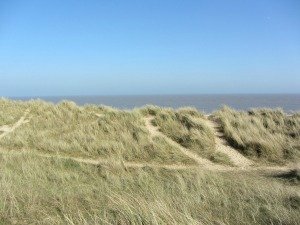 It’s the only village in Norfolk where the coast road actually runs along the edge of the sea, and it makes for exciting motoring! 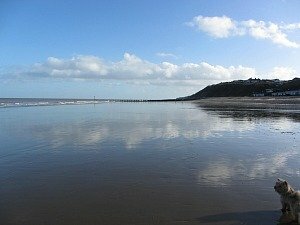 It’s not often you get to drive along right by the sea, but every time you do, you get a wonderful holiday feel engulfing you, making you instantly relaxed and more at ease with the world. 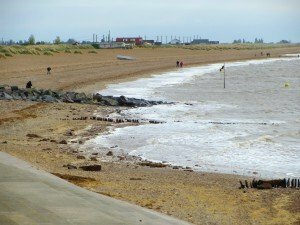 Walcott Norfolk is a small village on the east coast, and is constantly prone to coastal erosion, just like Hemsby beach and Winterton-on-Sea. 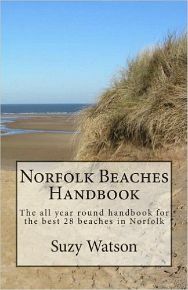 It’s not one of the most attractive Norfolk beaches that I’ve come across, there are many more picturesque beaches. 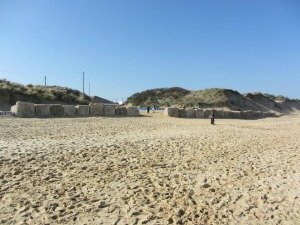 But due to severe coastal erosion along this stretch of coast, sea defences have had to be built here so they have tried hard with what they have available. 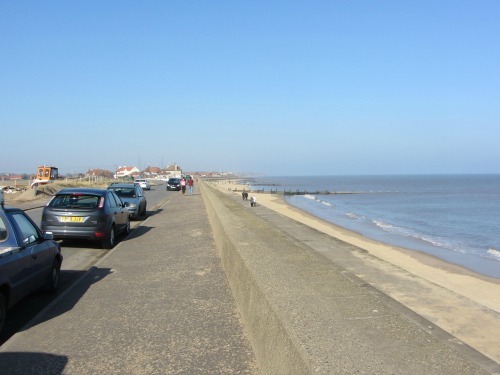 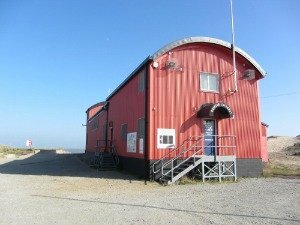 Walcott itself was badly damaged in 1953, 2007 and 2013 by the storms. 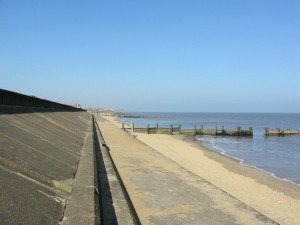 In fact in 1953 The North Sea flood meant much of the village was lost to the sea, so as you drive along the coast, this particular village is rather unassuming and quiet. 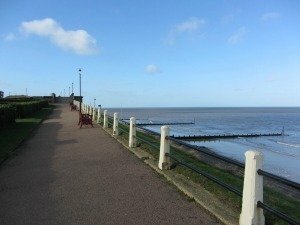 During severe storms, the road is blocked off. 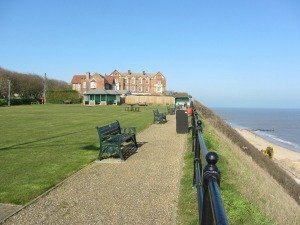 Not a lot goes on in Walcott, but just up and down the coast from here is Mundesley and Sea Palling. 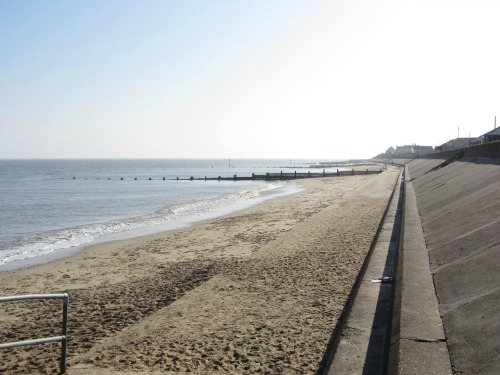 Cromer and Sheringham beaches aren’t too far away, and Hemsby and Great Yarmouth are also close by. 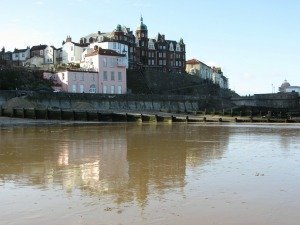 If you want a more lively village, then this one is probably not for you. 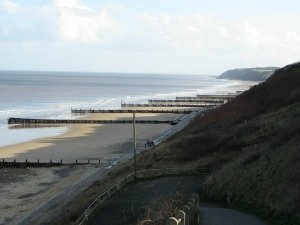 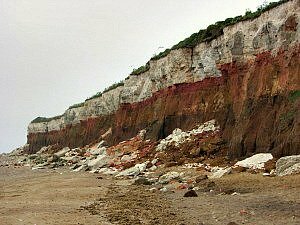 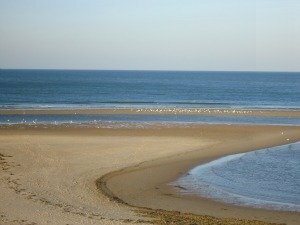 You also have the wonderful bay at Happisburgh which has no concrete sea defence at all. 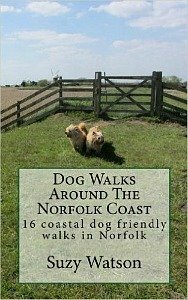 Having said that, Walcott is right on the Norfolk Coast Path. 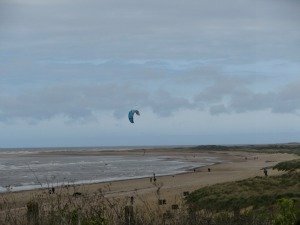 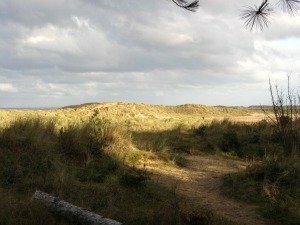 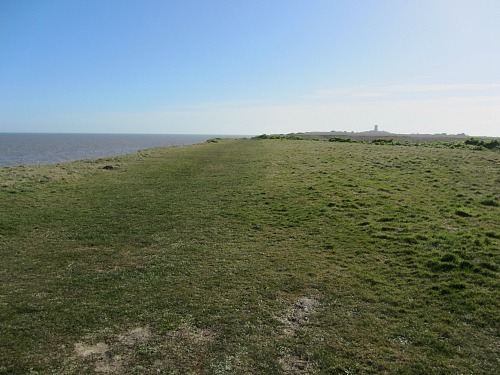 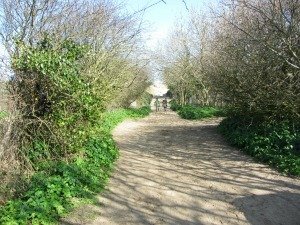 If you walk this trail, (and you can with our Norfolk walking holidays) you will have already walked from Bacton along the sea defence walls, so arriving at Walcott is no different. 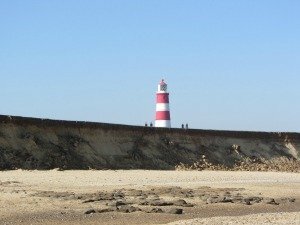 Once past here, you are then onto the cliffs heading towards glorious Happisburgh and the lighthouse. 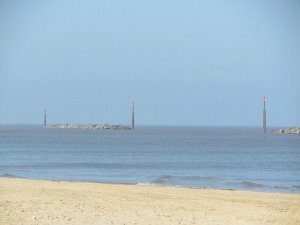 Walking this stretch of the Norfolk Coast Path really justifies ones thoughts about why these ugly sea defences need to be built. 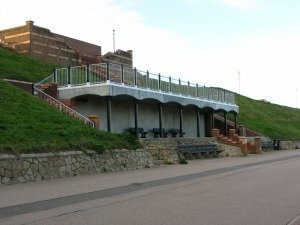 Without them, there would be no Walcott, no fish and chips, no beachside parking and no holiday parks! 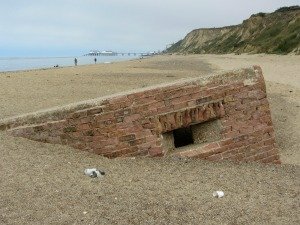 Easy access to the beach however, is a real draw here. 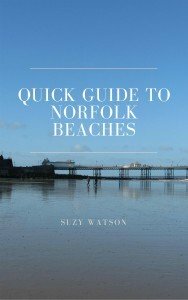 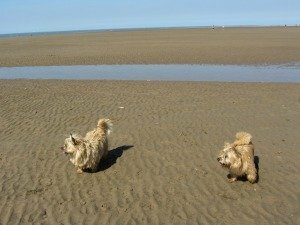 There is a caravan and chalet park opposite the beach so extremely easy to just walk over the road and down the steps through the sea defence and onto the beach. 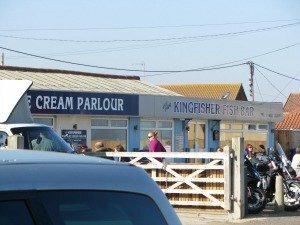 It does also have an excellent fish and chip shop, just what’s needed when you’re enjoying the seaside! 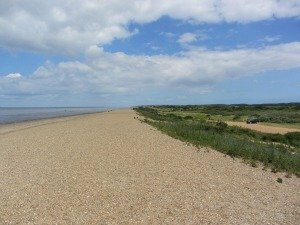 Walcott Norfolk, as one of the many Norfolk beaches, is a nice little stop off as you drive along the coast, maybe to grab some fish and chips, or stop at the café next door, or even just to go for a stroll along the seaside. 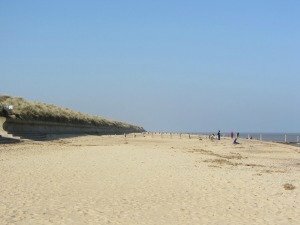 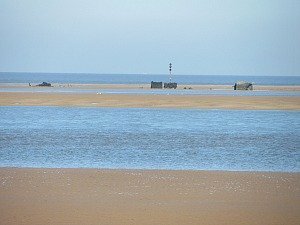 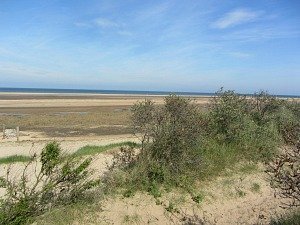 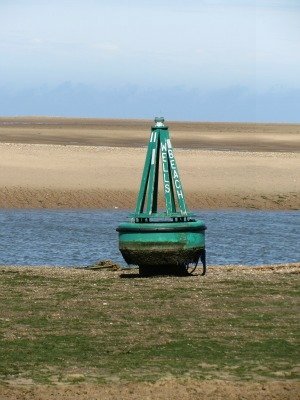 But if I’m being totally honest with you, in my opinion, there are many more glorious Norfolk beaches to explore, but at least stop and admire the view if you are passing by.